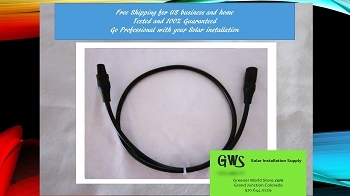 SOLAR CABLE WIRE UL TUV RATED, USA MADE USED TO CONNECT SOLAR PV POWER TO SOLAR ELECTRICAL COMPONENTS OR SOLAR PANELS. SOLAR PHOTOVOLTAIC WIRE CABLE IS UV AND WEATHER RESISTANT FOR OUTDOOR APPLICATIONS. USE OUR PHOTOVOLTAIC SOLAR WIRE TO INTERCONNECT SOLAR PANELS.